Sargent Sticks Hockey Sticks have one purpose and one purpose only. To give you the best product at the best prices. You will never be charged for the name or marketing, just what it costs to get the stick from the factory to you. We use one of the major stick manufacturing companies and buy direct from the factory in massive quantities. Instead of going from factory to company to retailer to consumer, we cut out the middle man and go direct from factory to consumer. This gives you a top quality product at a reasonable price in today's world of outrageous hockey stick prices. We warranty all of our products with an industry standard 30 day warranty. It's basically like any other $300 stick, just not as much money. Try the TTW-MD today and save an additional $40 of the retail price. Our premier full carbon hockey stick made for those that want the best at the best price. Mid kick with fast action, ultra lightweight, for those playing Juniors through the Pros. 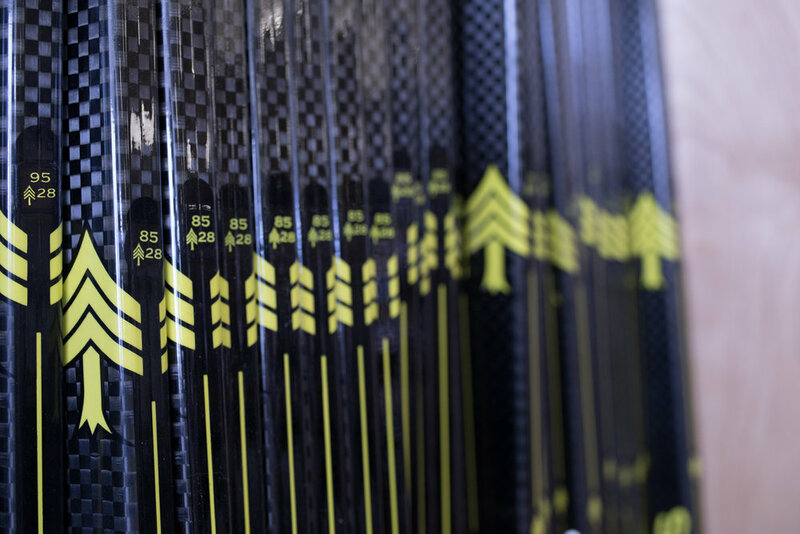 Similar in look to our premier stick, this one is for the person that just wants a solid composite hockey stick for every day use. Perfect for those just starting out or the weekend warrior. Wood handle foam core paddle and blade. This is the most versatile and consistent goalie stick on the market. A favorite of all ages from youth to college to adult leagues this paddle has stood the test of time and comes at a cost everyone loves!